Help us defend constitutional rights of raw milk consumers in Canada! Raw milk consumers across Canada have spent decades peacefully trying to obtain raw milk from local farmers despite the threat of harassment from the authorities. Finally, some of us have stepped forward to tell the courts that our constitutional rights are being violated by laws restricting access to raw milk – a food that is perfectly legal to consume in Canada. A January 2018 injunction against anyone “selling, delivering or distributing” raw milk in Ontario was the last straw, criminalizing peaceful citizens who want access to this safe, unprocessed food. So, with the encouragement of leaders from several cow-share communities in southwestern Ontario – we’ve mobilized! We found a highly experienced lawyer to represent us on a partly pro bono basis, and his legal team has been building our case at lightning speed. In early February they served a Notice of Application against the Attorneys General of Ontario and Canada, on our behalf – 19 raw milk consumers and two raw milk producers, whose freedom of conscience or religion, and security of person, are being violated (under sections 2 and 7 of the Canadian Charter of Rights and Freedoms). All 21 of us applicants made this commitment despite financial risk, the ordeal of being cross-examined, and fear of the unknown consequences of taking on the Government. We did this not only based on our personal conviction, but on behalf of our raw milk communities and other consumers across Canada, who all stand to benefit from this constitutional challenge. Last week we listed some of the major acts, laws and regulations being cited by Crown Lawyers in the latest manifestions, in the form of the 2 applications listed below, in the never-ending case(s) against Organic Raw Milk and its adherents, consumers, supporters, co-op members, farmers and producers in Ontario and Canada. For brevity’s sake we gave only the relevant sections from the Ontario Milk Act and Milk Regulations to begin with . We then observed, in Newmarket Court, the Crown Lawyers for Gavin Downing, director for the Milk Act, and the York Region Municipality, systematically work through all of those major acts, one by one in great detail, stating first which sections were violated, what they say and mean, and then the evidence (from myriad affidavits, discovery and testimony) to support their claims of violation, and punishment(s) sought. In addition to all the Acts and Regulations listed last week and again today, the Crown’s Legal team consisting of 4-5 lawyers, also cited 6-10 examples of Case Law which we will not list here. Of interest was the fact that they cited case law from England to justify the enforcement of certain bureaucratic regulations, and the need for concomitant restraining orders where they have been continually violated. Raw Milk Injection Site? Why Not? Michael Schmidt, Agricultural Renewal Coop, mothers, fathers, pastors and anyone involved in fresh milk production or consumption is threatened with arrest if they continue to provide raw milk or even encourage others to provide raw milk. The court proceedings are giving us a voice and we need YOU to stand with us. With 70 affidavits from farm owners, Michael and the attorneys are making the argument that this is a case of public interest. We need you there to help prove it! Background: York Region put in a motion for permanent injunction against distribution of raw milk. There is a motion in front of the court right now to have the application from York region to converted from an application to an action. This would change the dynamics of the procedure from a hearing before a judge to a trial before a jury. We want this case to appear before a jury. ACTION: Show the courts this is a case of public interest! 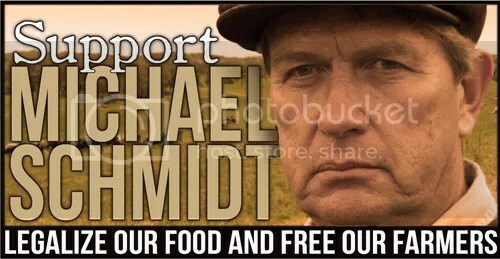 Join us in peaceful presence as we witness court proceedings against Michael Schmidt, his family, the entire herdshare and food freedom itself. Your presence is the strongest message we can send. Recent swat-style raids and arrest warrants on small farmers have inspired mothers and other activists to take their message, and a cow, to the courthouse where they plan to gather for a peaceful milk and cookies picnic. The rally will be at 8:30 am on March 16, 2016 Ontario Court of Justice 50 Eagle Street West in Newmarket Ontario. 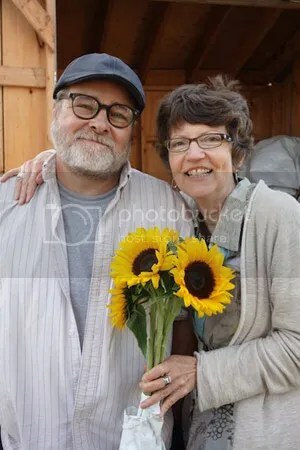 Last Saturday Sept 6th, friends gathered to say goodbye to Jeff Lucas and his wife Jill. And while most of those present knew Jeff primarily though his work as a friend of the Toronto Waldorf School and co-founder of the Carrville Community Garden, it’s only right that we should as well honour him for his work towards raw milk food freedom, as a staunch supporter of Michael Schmidt and the raw milk farmshare community.